Some people I approach about being the subject of a profile say no right away. Others agree to think about it for a day or so, but still end up saying no. The main reason is privacy, not wanting to be part of the public domain. Then there are the modest ones who insist they have nothing interesting to say. Everybody is unique, I tell them. Everybody has a story to tell. But it's understandable, isn't it? There you are, in black & white, under scrutiny, available for judgment. Marion is a very modest person; she thought about my invitation for several days. Fortunately, she broke through her modesty, and said yes. Everything about Marion is understated. She wears muted colours. She speaks softly. She's careful about not being intrusive. Her art, though, shows us another facet--a Marion that is urbane, witty, whimsical and humorous. This is evident in the postcards Marion recently designed and sells under her trade name, Clayoquot Eclectic, and all the posters she's designed for successive Lantern Festivals, Oyster Festivals, and Raincoast Interpretive Center programs. All are typical of this artist's imagination. Marion also designs the Friends of Clayoquot Sound Newsletter. Marion knew by her early teens that she wanted to be involved in the art world. In the late '70s she attended art college in Edmonton. Her first paying art job was with Edmonton's ITV Studio doing animation. She saved enough money in a year to realize a dream she had had since high school, reinforced by art history courses--to backpack around Europe, which she did for six months. Thrilled to see originals by some of Europe's great masters, it was the contemporary art that stimulated Marion to enroll in the Emily Carr College of Art when she returned. She graduated in inter-disciplinary studies, largely printmaking and painting. During our conversation, Marion reveals she can draw and paint in a representational, even very realistic style. But that's not what she likes to do, preferring subjects that, though natural, are not necessarily representational. After graduation, Marion scored a dream job with the Greater Vancouver Parks Department melding two things she loves--drawing and nature. For ten years she worked producing a variety of artwork for posters, maps, signs, educational material and promotional stuff --all hands-on work. She also became skilled in using computers for design. Marion and husband Michael Tilitzky, and son Liam have lived in Tofino five and a half years. I ask her as I do all people, Why Tofino? Marion, as it turns out, is a dedicated outdoorswoman. Raised on a small farm on the outskirts of Abbotsford when it was small and rural, she grew up roaming the back roads of the Fraser Valley on horseback. In Vancouver, she and husband Michael escaped the city every possible weekend, hiking and camping in the mountains. They began thinking where they could live that had rural aspects, a community, and was not a "hick" town. Tofino fit the bill. They bought property, and contracted Peter Stade of Ucluelet to build their house. The design of the house earned Peter a West Coast Award for a house design less than 2500 square feet. No one I have interviewed has ever said they dislike Tofino. Marion's face lit up when she said, " I love it here!" Then she elaborated with an interesting analogy. "I feel like an invasive species, like the Scotch broom plant that can't really be eradicated from the place it landed and rooted." Marion can trace her family roots back to the Mayflower pilgrims and the United Empire Loyalists who fled to Canada in order to remain loyal to Britain. Despite such a family history, she feels all Canadians are recently-rooted folks compared to Canada's indigenous people, and she respects that. In their few years here, Marion and husband Michael have contributed significantly to Tofino life. It is they who have established the increasingly fabulous annual Lantern Festival. Each year Marion creates more lanterns, holds creative workshops for the public, helps put the show up and take it down, then stores the lanterns in a crawl space under her house. That's dedication. Marion is an artist who has "an aversion" to calling herself an artist. Nevertheless, she is going to have a show. Starting November 21st, a body of work on paper called Waves will be on display and for sale at Sobo restaurant. "What has prompted you to finally come out and exhibit?" I ask, knowing that Marion doesn't even sign her name to the many things she has produced around town. "Though I've been producing art for years, I have had to overcome considerable reticence about 'showing and selling', she said. "Money is the last thing most artists think about. If I were independently wealthy, I would give all my work away. I want to help make a living for my family, and being able to do so via my art is a bonus." Speaking of the local art scene, she laments that work by most local artists is largely seen in the retail sector competing with dozens of non-local artists. "It would be great if there was a community art center where talented local artists could exhibit their work in a less commercial atmosphere." 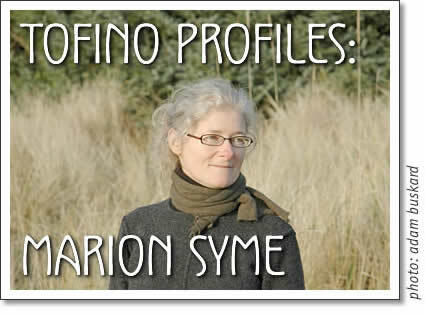 Marion Syme is an artist with a social conscience. Through her art, she wants to show how privileged we are to live in a place of such tremendous ecological significance, and promote awareness of the fact that Tofino is located in a Biosphere Reserve. She does that, in her own subtle way.